What If Utilities Are to Blame for Wildfires? This week on The Energy Gang: PG&E and SCE face scrutiny over fire damage. Californians are looking for someone to blame for the destructive wildfires. Is it utilities? California has seen a million and a half acres of forest burned this year. As the state recovers from the devastating Camp fire and Woolsey fire, residents are looking for someone to blame. Now attention turns to utilities. Both Southern California Edison and Pacific Gas & Electric are under investigation and facing class-action lawsuits for potentially starting the blazes. What happens to utilities if they are found at fault? 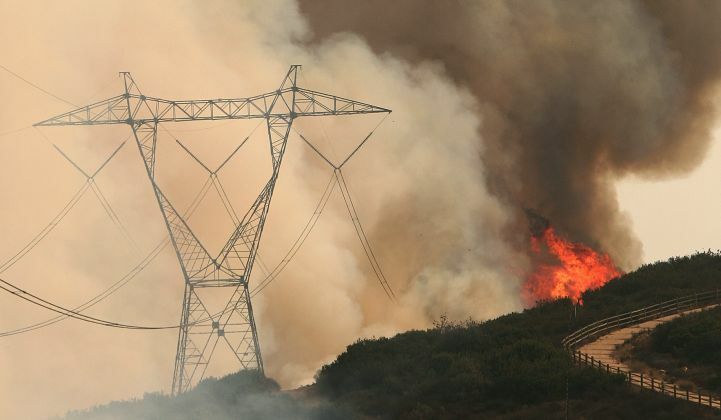 And how do you protect a vulnerable electric grid as these fires get worse and worse? We'll discuss. Then, we’ll mark the Thanksgiving week in the second half of the show. We’ll each share our picks for the top turkey of 2018. Who made the biggest blunders this year? GTM: If Wildfires​ Drive PG&E Into Bankruptcy, What Happens to Renewable Energy Contracts? The Energy Gang is brought to you by GE's Reservoir, a modular lithium-ion energy storage system that can slash construction costs by 50 percent. Find out more about what Reservoir can do for your electric grid, solar plant, wind farm, microgrid or thermal power plant. We’re giving listeners major discounts this fall. Use the promo code PODCAST to get a $50 discount for a GTM Squared membership and 20% off our final GTM conferences of the season. Get your GTM conference discount here. Get your GTM Squared discounted membership here. Subscribe to The Energy Gang podcast via Apple Podcasts, Spotify, Google Play, Stitcher or wherever you find your audio content.